Access and connectivity policies control network connections, dial-up connections, and Remote Assistance configurations. These policies affect a system's connectivity to the network as well as remote access to the system. Many network policies are available. Network policies that control Internet Connection Sharing, Internet Connection Firewall, Windows Firewall, and Network Bridge are configured at the computer level. Network policies that control local area network (LAN) connections, Transmission Control Protocol/Internet Protocol (TCP/IP) configuration, and remote access are configured at the user level. The primary policies that you'll want to use are summarized in Table 1. You'll find Network policies under Computer Configuration\Administrative Templates\Network\Network Connections and User Configuration\Administrative Templates\Network\Network Connections. Determines whether users can install and configure network bridges. This policy only applies to the domain in which it is assigned. Determines whether users can enable the Internet Connection Firewall. This policy only applies to the domain in which it is assigned. Determines whether administrators can enable and configure connection sharing. This policy only applies to the domain in which it is assigned. Determines whether users can view and modify the properties of remote access connections available to all users of the computer. Determines whether users can delete remote access connections available to all users of the computer. Determines whether users can enable or disable LAN connections. Determines whether users can change the properties of LAN connections. Determines whether users can access and change properties of remote access connections. Determines whether users can delete remote access connections. Determines whether users can access advanced TCP/IP settings. Access Group Policy for the resource you want to work with. Next, access the Network Connections node by expanding Computer Configuration\Administrative Templates\Network\Network Connections. Double-click the policy that you want to configure. On the Setting tab, select Enabled or Disabled as appropriate. Click OK.
Access Group Policy for the resource you want to work with. Next, access User Configuration\Administrative Templates\Network\Network Connections. Remote Assistance policies can be used to prevent or permit use of remote assistance on computers. Typically, when you set Remote Assistance policies, you'll want to prevent unsolicited offers for remote assistance while allowing requested offers. You can also force a specific expiration time limit for invitations through policy rather than setting this through the System Properties dialog box of each computer. To improve security, you can use strong invitation encryption. This enhancement, however, limits who can answer Remote Assistance invitations to only those running Windows Vista or later releases of Windows. Access Group Policy for the computer you want to work with. Next, access Computer Configuration\Administrative Templates\System\Remote Assistance. Double-click Solicited Remote Assistance. On the Setting tab, select Enabled. When enabled, this policy allows authorized users to respond to remote assistance invitations. Allow Helpers To Remotely Control This Computer Permits viewing and remote control of the computer. Allow Helpers To Only View This Computer Permits only viewing; assistants cannot take control to make changes. Next, as shown in Figure 1, use the Maximum Ticket Time (Value) and Maximum Ticket Time (Units) fields to set the maximum time limit for remote assistance invitations. The default maximum time limit is one hour. Click OK. 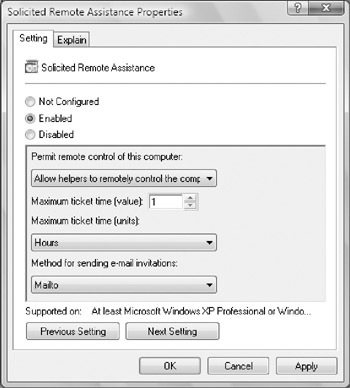 Figure 1: Set a time expiration limit for Remote Assistance invitations. The method for sending e-mail invitations is set to Mailto by default. This is a browser-based mail submission technique in which the invitation recipient connects through an Internet link. You can also select Simple MAPI to use Messaging Application Programming Interface (MAPI) for sending the e-mail invitation. When you do this, the invitation is sent as an attachment to the invitation e-mail message. As long as computers can establish a connection with each other over port 80 and you're using a standard e-mail program, such as Microsoft Outlook or Outlook Express, you'll probably want to use Mailto. Double-click Offer Remote Assistance. In the Offer Remote Assistance Properties dialog box, select Disabled. Disabling this policy prevents unsolicited assistance offers. Click OK. If you want to use strong invitation encryption and limit connections so they can only come from computers running Windows Vista or later releases of Windows, double-click Allow Only Vista Or Later Connections. In the Allow Only Vista Or Later Connections dialog box, select Enabled. Click OK.
Double-click Solicited Remote Assistance. On the Setting tab, select Disabled and then click Previous Setting or Next Setting as appropriate. In the Offer Remote Assistance dialog box, select Disabled and then click OK.